Click here to go to your Account Info page. If you're not signed in, please enter your email address and password to continue. Click the Edit button under the Email Address or Password section. Enter the new email address or password that you'd like to use. Even if the email address you previously used when signing in to Big Fish Games is no longer valid or you no longer use it for your email service, you can go ahead and sign in to Big Fish Games with that address again. Once you sign in, you can enter a new email address by following the steps above. Please add no-reply@bigfishgames.com and support@bigfishgames.zendesk.com to your safe-senders list to ensure that you receive your reset password via email. Click Sign In and enter your account information. Visit your Account Info page. Use the steps above to try changing the email address or password right away. 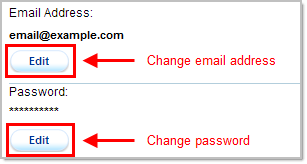 This should help refresh the page, allowing your email address or password to update successfully. A separate account has already been created using the new email address. Once an email address is registered in our system, it cannot be used on additional accounts. You may keep the account under its current email address. You may update to a different email address. For example, if you have an additional email address that you use, or if choose to create a new one, you could put the account under that address.